What exactly is a stomach ulcer? On the stomach wall, there is a protective mucosal layer in which the cells produce hydrochloric acid. With a stomach ulcer, a hole has formed in the protective mucosal layer. If the gastric juice comes into contact with the nerves in the stomach wall, it causes a painful feeling. So health, well-being and performance can be seriously affected by stomach ulcers. The wound in the mucosa often occurs at the entrance of the duodenum (the first part of the small intestine). Gastric ulcers are better prevented than cured! Adjust the feed and stable management. We give 5 tips to prevent stomach ulcers! Choose a high-fiber concentrate feed ration. The Hartog muesli 's for recreation and sport horses contain a great deal of fiber - For example, for a fiber-rich muesli choose the Hartog Balance and for sport horses with a low proportion of starch choose the Energy Special. The stomach of the horse is very small with a capacity of about 10-15 liters. The stomach consists of two parts. The lower part of the stomach produces acid throughout the day. Especially with an intake of a lot of starch from, for example, concentrate, the production of stomach acid increases. When concentrates are taken, less acid buffering saliva is litigated while stomach acid production rises. Therefore, it is advised to never feed more than 2 kg of concentrated feed per feed. To prevent stomach problems, it is often recommended to add fibers such as lucerne to the concentrate feed so that the chewing frequency and saliva production increases. Even with a fixed period (a period without fiber-rich food) longer than 4-6 hours, the amount of stomach acid increases considerably. With a large amount of stomach acid, the upper part of the stomach is affected. This part of the stomach consists of less thick mucosa and is much less resistant to the stomach acid from the lower part of the stomach. In the lower part of the stomach the pH can drop below 2-3, while the upper part of the stomach has a pH of 6-7. Horses that have to perform a peak performance with a richly filled stomach are more likely to suffer from stomach ulcers. The acid comes into contact with the thinner mucous membrane in the upper part of the stomach. In the upper part of the stomach there is a small bacterial population that is resistant to an acidic environment. These Fundus bacteria mainly live on starches and sugars in the feed, producing lactic acid. With a large intake of starchy concentrates and / or low amount of roughage the pH decreases in this part of the stomach, which can also cause ulcers. With a very high-fiber ration, fewer bacteria are produced by the bacteria and the risk of stomach problems is reduced! Stress as a cause of stomach problems? These symptoms aggravate the stomach because these horses eat less well, are constantly active and alert and / or receive too large amounts of concentrates. In order to reduce or restore (the risk of) stomach ulcers, it is necessary to reduce the above stress factors. How do you recognize a stomach ulcer? 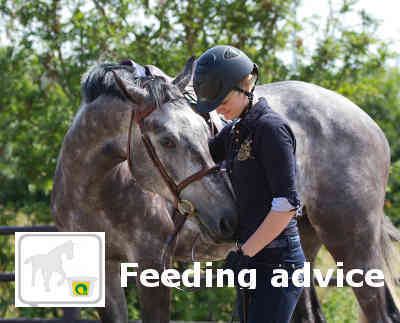 Of course every horse keeper tries to take care of his or her horse optimally. We know during practice it is sometimes difficult to divide roughage into 4 feeds. Not all horse owners can also influence the quality and amount of roughage that is provided. That is why Hartog has developed the Lucerne-mix Digest which optimizes the stomach and intestinal health of the horse. The Lucerne mix Digest is enriched with POWERSTART®. This special blend with natural micro elements is combined with acid buffers, prebiotics and yeast cultures. Why is the Hartog Lucerne mix Digest different from the other products for stomach and intestinal problems?